The first attempt at Lemon Meringue Pies tasted like the Glen-Mor restaurant version, but the meringue was not high enough. 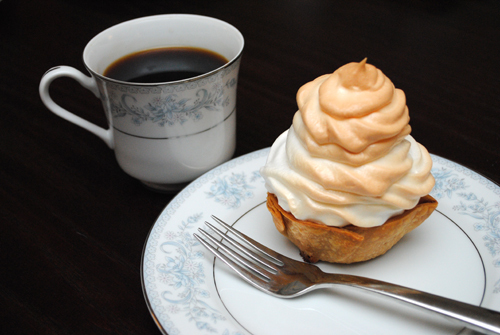 This time we piped the meringue in a pastry bag and Jim said the result succeeds in duplicating the Glen-Mor version. Preheat the oven to 350 degrees-F. Follow the instructions for the Pie Crust recipe, making six crusts with a biscuit cutter. Form a dough piece over a small upside-down ramekin, repeat with remaining five dough pieces. Alternately use an upside-down 12-muffin pan. Place the ramekins on a cookie sheet. Par-bake the crusts for ten minutes, remove from oven and let cool on the ramekins or muffin pan. Melt the butter and set aside to allow to cool. While butter is cooling, zest the entire lemon and set zest aside. Halve and peel the lemon to discard the pith. Slice the remaining lemon into thin slices. Remove seeds. Place the lemon and sugar in the work bowl of a food processor and mix until lemon is pureed. Add the eggs, cornstarch, and salt to the lemon mixture and process until smooth. Add the melted butter and mix until combined. Remove par-baked crusts from ramekins and fill each crust with the lemon filling, leaving approximately 1/4-inch between the top of the filling and the top of the crust. Place the pie a cookie sheet with sides in case there is any overflow during baking. Bake for 25 minutes or until the pies are almost set, filling should be slightly jiggly when pan is removed from the oven. 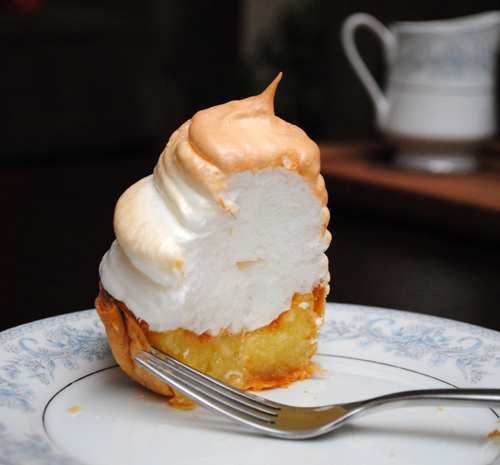 While pies are baking, prepare the Meringue topping. Once pies are out of the oven, reduce oven temperature to 300 degrees-F.
Top the partially baked pies with 1 cup of meringue, piping the meringue with a pastry bag into a cone. Return pies to the oven and bake for an additional 15 to 18 minutes or until meringue is browned. Let pies cool and serve at room temperature. Store in the refrigerator for up to 2 days.